Why is proper footwear ignored so often today? Guys think they can look good while wearing their Asics running shoes alongside their chinos and sports coat. Or better yet, wearing Jordans with their slacks and dress shirts. God bless these people, but let's get our act together gentlemen! The reality is, shoes can literally make or break an entire outfit. Nothing saddens me more than a man who wears a flawless outfit on top, then completely ruins it with an odd, beat up pair of shoes. Let's talk about upgrading your look from the bottom up. Let's talk dress shoes. To keep it nice and simple, let me tell you that you need to own at least one pair of black, and one pair of brown dress shoes. I'll be focusing on black shoes in this post, as I believe it is the more important of the two. Yes, black dress shoes are everywhere. You can go to Kmart and get a pair right now for under $20, or you can spend $1000 on a pair of Santonis. The range of choices makes shopping for black dress shoes a bit more difficult. So let me see if I can guide you a bit. What's a good style? I'd say the first pair of dress shoes you need to get are a pair of oxfords. Forget derbys or loafers, you need to go with an outright classic. Make sure the shoe looks nice and streamlined, without a boxy toe. Square or boxed toes used to be popular at one point in history, but today, people will dismiss any sense you have in style if you're caught wearing them. You want a rounded toe that helps elongate your foot a bit, and stick to a classic leather texture (no grains or patent leather). Also, if you like the Captoe look, go for it, since it's accepted in all formal situations as well. If you can, I'd say go for a leather sole. Not all rubber soles are bad, but leather soles will usually last longer, as they are generally stitched onto the shoe and not glued like rubber. How much should I pay? Personally, I think you shouldn't spend any less than $100 on a pair of nice dress shoes. 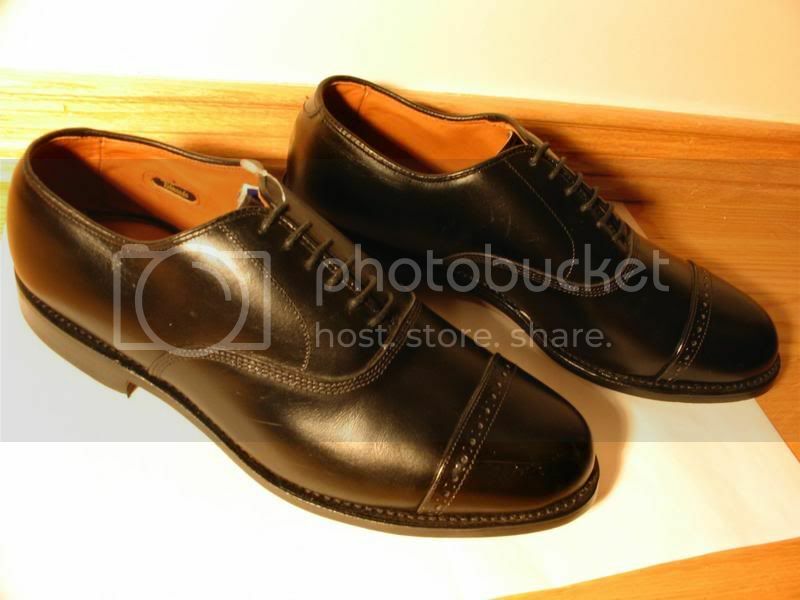 Good news is that you can find sales on black dress shoes quite regularly. Whether it be Nordstrom's anniversary or half yearly sale, Macy's sales and coupons, or seasonal fall and spring sales just about anywhere, you can find a nice pair of black oxfords for much less than retail price. I personally spend about $200-$300, since I can find amazing quality shoes at those prices. What can I wear them with? In terms of pairing, the part that matters is really the pants. Dark denim and grey, navy, or black slacks should do the trick just fine. What is a good brand? This will largely depend on your budget. For me, the best bang for the buck shoe company is Allen Edmonds, hands down. Their shoes range from $200-$400, so they're not cheap, but they are excellent quality. In my opinion, no other brand matches them at their price point. By the way, right now they're having a huge sale! Check out their website and get a pair while you can, the promotion ends Oct 9. Below that price-range, I would probably recommend a shoe maker called Meermin or possibly Johnston & Murphy. Going above Allen Edmonds, my favorite brands are Crockett & Jones, Alden, and Santoni. Just a warning that the prices can get very high with these brands. The right pair of black dress shoes can last you a decade, and with the proper care, even longer. Many high end shoe manufacturers will also resole your shoe for you at a pretty reasonable cost, shipping the shoe back to you in almost new condition. Know that spending the extra money for a good one will be worth it in the long run. So, feel the need to start looking classier? Get yourself a pair of nice black dress shoes! It'll make you look exquisite... I guarantee it.